A HEAVY downpour bringing weeks worth of rain could hit the Northern Rivers this week with more than 100mm forecast in some parts over the next two days. Moisture from two tropical cyclones will cause widespread rain and thunderstorms across central and eastern Australia this week, with a high chance the thunderstorms will start to form today as a strong cold front crosses over. Some models suggest up to 300mm of rain could accumulate, but BoM is forecasting half of these totals. Tropical Cyclones Trevor and Veronica both affected northern Australia on the weekend. BoM Forecaster Anita Payne said there was a change coming in the hot and dry conditions we have been seeing. "It's getting cooler and wetter," she said. "At the moment we have a cold front coming through NSW. It has big cloud band which is being fed by moisture by Ex-tropical Cyclone Trevor. 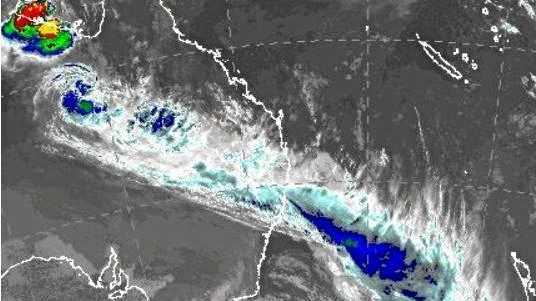 "That circulation has moved down into middle of Northern Territory, and in Western Australia there is tropical cyclone Veronica which is feeding into the moisture. "As the cloud band gradually moves north-east into tomorrow we are expecting to see rainfall in the Northern Rivers. "There is particularly a chance of thunderstorms around today which will hang around through Wednesday and Thursday. "There's a chance of potentially heavy falls depending how the thunderstorms play out." Ms Payne said the amounts of rainfall were very storm dependant but "it could be quite wet". Up to 50mm may fall each day in Byron Bay tomorrow and Thursday, easing to showers on Friday. Lismore and Ballina could receive up to 45mm on theses days. Ahead of the weather, the NSW SES is encouraging all Northern Rivers and Mid North Coast residents to stay aware and informed but not be alarmed as the effects of ex tropical cyclone Trevor move southwards towards the Northern Rivers area. 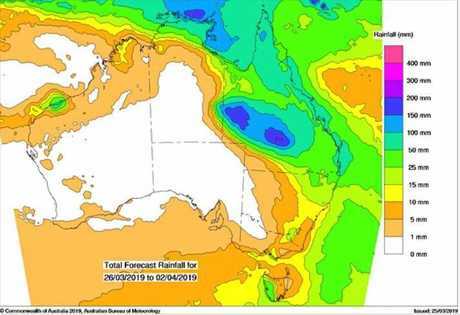 NSW SES Northern Rivers Deputy Zone Commander, Mr Mark Somers advised, "The intensity and path that Ex TC Trevor takes over the next few days will govern how much rain falls over northern NSW. The Bureau of Meteorology will forecast rainfall amounts over the coming days as they monitor the behaviour of the system as it nears NSW." Mr Somers advised: "It's early days at this stage but now is a good time to prepare". "There are a couple of important things you can do now to get ready for a severe weather event and these include checking your home and/or business emergency plan is up to date and to make sure your emergency kit is stocked and ready for use." NSW SES Community Capability Officer, Janet Pettit added: "A part of your emergency plan should be to putting together an emergency kit. This kit should include items that you may need if you lose power or need to evacuate your home in a hurry." Waterproof document holder for these documents and valuables."